When Tracy invited me to host a couple of creative sessions at the ‘Sacred Marks” retreat in Bali, I just knew that creating a journal to record all the inspiration around us would be perfect. 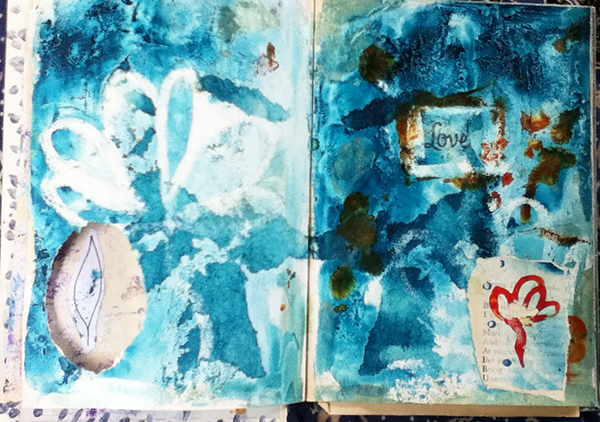 Initially, I thought we could create a hand-made book (similar to the ones I create for my rainbow joy journal class) however, this idea morphed into us creating a beautiful altered book. So today, I wanted to show you some of the pages of mine in progress so far. 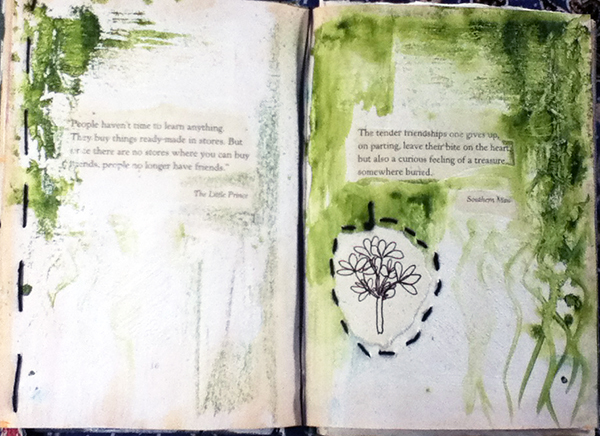 We asked each of the students to bring a book that spoke to them or resonated with them which we would then alter with inks, paint, sewing, sketches, collage and lots more. 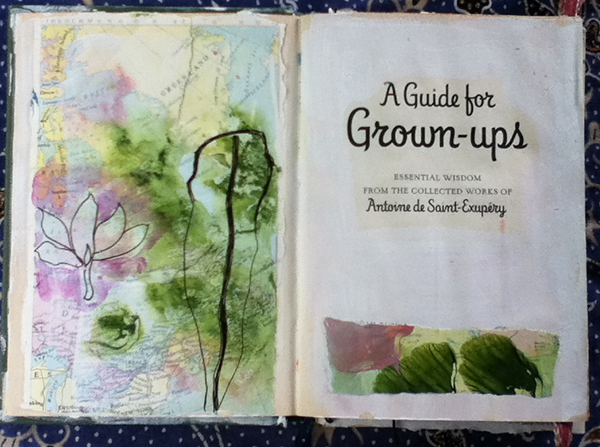 I chose “A Guide for Grown-ups: Essential Wisdom from the Collected Works of Antoine de Saint-Exupry” which I love. It is full of quotes from all of his books and space on each page to add colour and sketches. 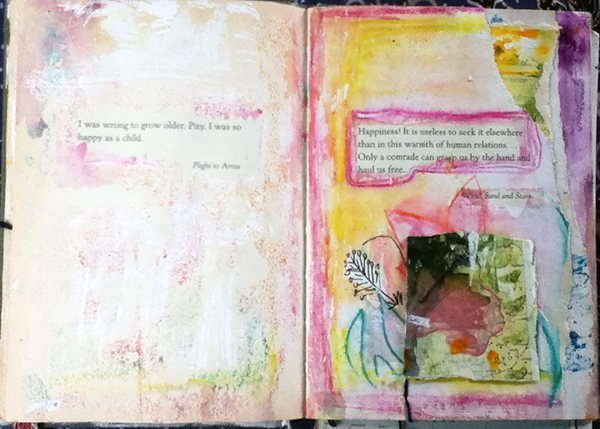 It was so lovely to revisit this book as I layered gesso on as a base and read each quote as I traveled through, page by page. 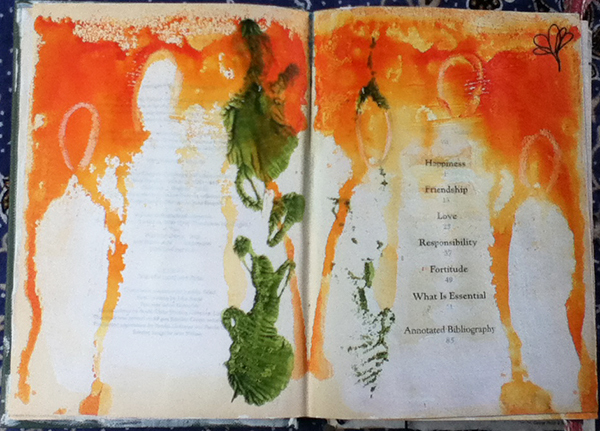 Above is the contents page of the book where I added orange ink and sprayed with a water spray bottle. As the ink moved about the pages, I started to see figures emerge so decided to keep these pages just so. I love to open the book and see these ‘friends’. I really love the old creamy colour of the book pages and thought about keeping these as they were, but to make them a little more robust for the layers of inks, water and more paint, it was definitely a good call to gesso them first! Some of the pages, I have saturated with vibrant colour, like the one below. I love the energy of turquoise and marine blue together. I also used a wax crayon to act as a resist to show the white lotus sketch. These pages also have little ‘potholes’ where I have torn holes to reveal what is on the previous and next pages. 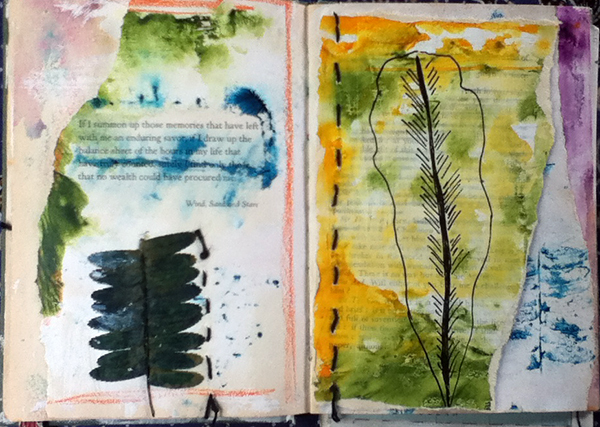 Then in constrast, other pages have just one colour covering some of the page to give them a light and textured look. Below you can also see where I have glued a little flower sketch from my sketchbook and sewn around that to add another little piece of detail. 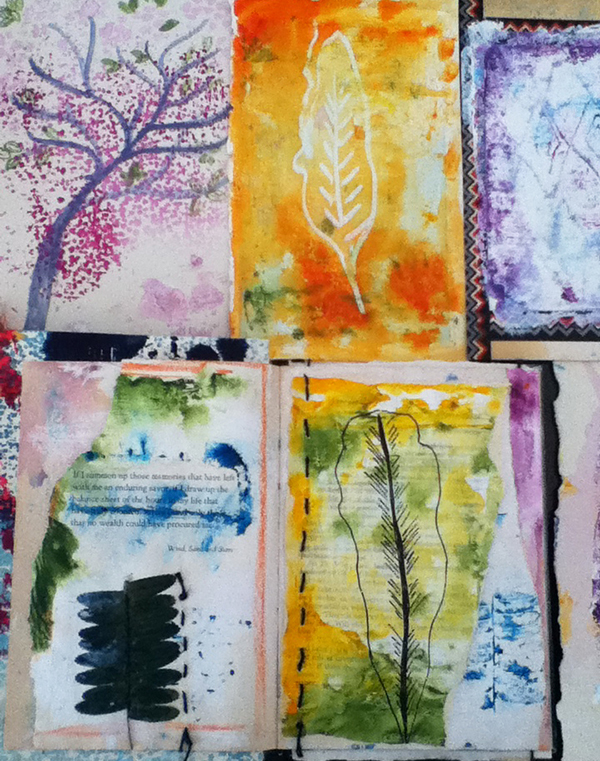 As a nature lover, I just had to use some of the Bali nature studies from my sketchbook to include. So much inspiration and beautiful patterns around us. Some of the pages have the contrast on the double page spread and below I have torn the edges of the pages to reveal the colours of pages behind. I love the mix of colours and textures. Thanks again for visiting and it is so wonderful to share this journey with you. Would you like to join me on one of my upcoming online classes? 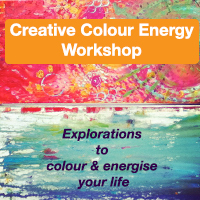 Registration for my popular “Color Energy Class” is open and class starts on Monday 1 September 2014.